Are you looking for a complete course in Bulgarian which takes you effortlessly from beginner to confident speaker? Whether you are starting from scratch, or are just out of practice, Complete Bulgarian will guarantee success! This pack includes a book and two CDs of audio material. Dr. Mira Kovatcheva, Associate Professor in the Department of English and American Studies at the University of Sofia. Currently lectures on History of English, Languages in Contact, Formation of Slang. Dr Kovatcheva has been teaching Bulgarian as a foreign language since 1989 when on a three-year secondment to Leeds University. Jointly authored (with Professor Michael Holman) Teach Yourself Bulgarian (Hodder & Stoughton, 1993, revised second edition 2003). Since 1994 has conducted the Bulgarian oral examinations for the Test and Examination Services of the Foreign and Commonwealth Office Language Group. Regularly teaches Bulgarian as a foreign language to visiting academics under the Fullbright Exchange Program. Recently authored a self-study sourcebook for advanced learners of Bulgarian: Bulgarian: Beyond the First Steps (Prosveta, Sofia 2005). Michael Holman, Emeritus Professor of Russian and Slavonic Studies, University of Leeds. Taught Bulgarian and Russian at Leeds 1966-1999. 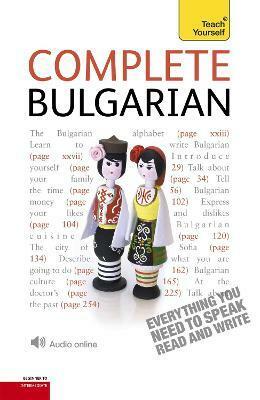 Has translated from Bulgarian and written on a variety of Bulgarian-related topics. While at Leeds and since taking early retirement has sought to promote Anglo-Bulgarian cultural interchange. For this he was awarded the 'Order of Stara Planina' (First Class) by the Bulgarian Government and an honorary Doctor of Letters by the University of Sofia. Jointly authored (with Dr Mira Kovatcheva) Teach Yourself Bulgarian (Hodder & Stoughton, 1993, revised second edition 2003).